Having been turned away from the ancient convent of St. John the Baptist, in 1910 some Augustinian nuns found refuge in the adjacent building on Via A. Saffi, where they reside to this day. In 1918 they began building the new church, which was inaugurated in 1923. The building was constructed in extremely simplified neo-Gothic style, based on a design by local master mason Giovanni Artusi. 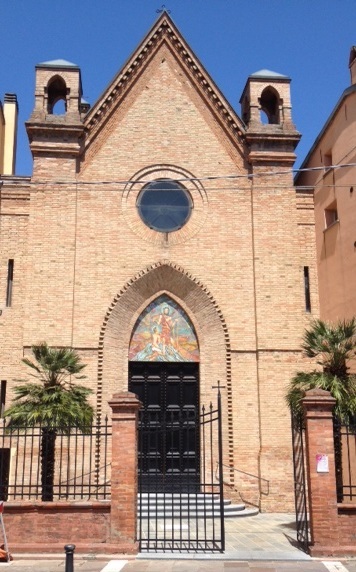 The façade has a delightful majolica lunette of the Baptism of Christ, a piece created in 1989 by Faenza-born artist Goffredo Gaeta (born 1937). Inside, the single central nave with cross-vaulted ceiling is bound by semi-pillars and ribs decorated with horizontal white and earthenware tile stripes. Behind the modern altar is an elegantly carved wooden choir, with a late 20th-century Crucifix on the wall.